Cloud is finished! Forget SEO, the title for this post is “Ol’ Spiky Head”. Now all that’s left is to finish the rest of the city, which is mostly hidden behind Cloud anyways. Should be just another day or two before it’s all finished. There are a few bits here and there that bug me a little, but I plan on going back and doing some editing later on. Take that gauntlet/glove for example; it’s way too bright. The shape of it isn’t easily definable. It should be very easy to fix though, so that’s good. 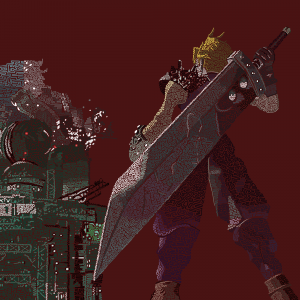 Other than that, Cloud’s right arm is a little weirdly colored. Not to mention that his left leg’s bright spots aren’t as bright as his right leg’s bright spots. Maybe some these nitpicky things don’t make sense to other people, but in my head they stand out as errors. Fixable errors though. Thankfully. I have to try and remember something for tomorrow, so writing about it here might be a good reminder. I find that when I write something down, I’m way more likely to remember it. I need to make this image into two different layers in Photoshop. There’s Cloud, and then there’s the city in the background. I may want to try adding a gradient effect to the city layer at some point to have it flow nicely from lighter to darker from the top to the bottom. Seeing as the end of the sword is the only bit currently crossing over into the other section of the drawing, it shouldn’t be overly difficult to separate the two into individual layers. This entry was posted in Abstract, Photoshop, Scene, Work in Progress. Bookmark the permalink.